Image example South Korea respond with live bombing exercise. Japan tell im citizens on Tuesay to hide for inside strong building and for underground as North Korea missile pass Hokkaido Island for Japan before im land for sea. Japan Prime Minister Shinzo Abe don call dis one serious threat against im country. Im say im don follow President Donald Trump talk and im say both of dem gree say dem must increase pressure on top North Korea head. 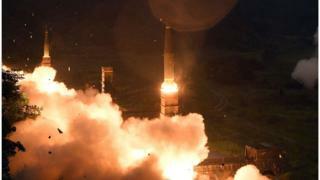 North Korea dey carry out many missile test, for 1998 and 2009 North Korea fire rocket pass Japan but dem say na to launch satellite. Dis na di first time dem go fire real ballistic weapon pass Japan. US and Japanese forces just finish drill for Hokkaido and another military exercise wey thousands of South Korean and US soldiers dey join do still dey go on for South Korea. North Korea dey see all dis as provocation say dem dey rehearse to attack dem. Early dis month, North Korea threaten to fire US territory Guam and President Donald Trump respond say dem go see ''fire and fury'' if dem try am. China don draw ear give dem say di tension for the Korean Peninsula don pass be careful and say US and South Korea suppose share di blame say na their military drills dey make North Korea tense. UN Security Council suppose hold emergency meeting on top di matter.